Victory Tool, an Anoka, MN, tool-and-die manufacturer, was in a quandary, and it needed to find a better way. The company had been outsourcing the machining of large, complicated progressive die sets and components. Though outsourcing work can be costly, keeping that same work inhouse, without the right equipment, can minimize flexibility and hinder efficiency. Just what could Victory Tool do? Founded in 1987, Victory and its 27 employees manufacture metal-stamping dies in 20,000 sq. ft. of space, with sales averaging $4-5 million annually. Customers include OEMs and metal stampers in a range of industries including automotive, aerospace, medical, recreational, lawn and garden, and appliance. Victory typically machines carbon, tool and hardened steel such as D2, A2, 4140 and hot-rolled. Each stamping die is unique, based on customer requirements and the complexity of the part. The new bridge mill readily works carbon, tool and hardened steel such as D2, A2, 4140 and hot-rolled, enabling Victory to tackle many complicated jobs, such as large, progressive stamping dies with tight tolerances and multiple, complex features. 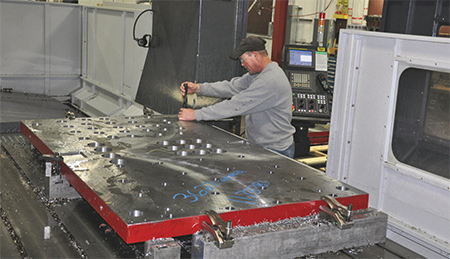 Victory was outsourcing the large die components, or moving them around on the beds of its inhouse milling machines to perform machining in stages. At the time, Victory had two vertical machines and one horizontal machining center. The company was spending too much time on setups and re-machining of components due to these limitations. 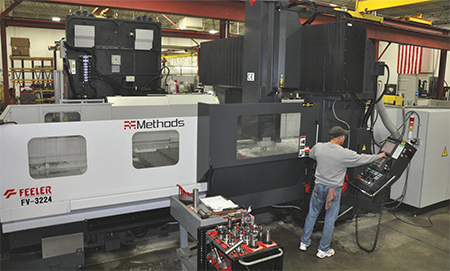 Victory’s machine-tool provider, Concept Machine Tool, Minneapolis, MN, recommended that Victory consider a Feeler FV-3224 50-taper, heavy-duty, double-column bridge mill from Methods Machine Tools, Inc. (Sudbury, MA) to solve its manufacturing challenges. Victory decided to move ahead and purchase the bridge mill, and by April 2014, the machine was delivered and installed. The FV-series mills include extensive design and engineering by Methods to facilitate the production of large components, and feature THK linear guideways on the x axis and Schneeberger roller linear guideways on the y axis. A stepped y-axis beam along with the machine weighing as much as 82 tons contribute significantly to rigidity. With the mill’s ample axes travels–126 in. on the x, 95 in. on the y and 35 in. on the z–Victory can machine large parts inhouse. Victory manufactures complex dies for Tier One stampers and OEMs, with progressive dies its specialty. Victory also takes advantage of the mill’s versatility by running a range of jobs with a variety of workpiece sizes, from small to large. To improve efficiency, in August 2014, a custom 90-tool automatic tool changer (ATC), the first of its kind installed in the United States, was added to the mill. The ATC has greatly reduced set-up times and increased efficiency to meet tight-tolerance specifications versus Victory’s older machines, which only offer 24-tool selection. 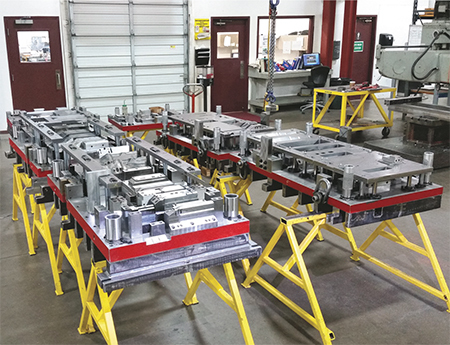 Typically, Victory uses 76 tools each day, so tool standardization is key to minimizing tool changes, saving time and reducing required programming. Victory tackles many complicated jobs, such as large, progressive stamping dies with tight tolerances and multiple, complex features. Acquisition of the Feeler mill has far exceeded Victory’s original expectations, with the company expecting an ROI of less than three years. Simonson and his team are impressed with the rigidity and reliability of the mill, and are confident enough to run the machine unmanned. And, as word has gotten around in the metalforming industry about Victory’s large bridge mill and its capability to take on a broader range of work, Victory is now taking on the machining of large plates. Article provided by Methods Machine Tools, Inc., Sudbury, MA; tel. 978/443-5388, www.methodsmachine.com. Information also contributed by Victory Tool, Anoka, MN; tel. 763/323-8877, www.victorytool.com. See also: Victory Tool, Inc., Methods Machine Tools, Inc.
Congratulations to the team at Victory. The machine is a nice fit.